Premiere Monday was great (almost) all around. The same could not be said for Monday of week 2. 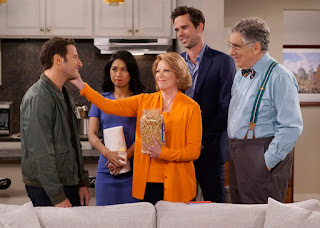 9JKL made its debut on CBS last night. The show had mediocre retention from its lead-in The Big Bang Theory and, with a 1.6, was a huge downgrade from last week's Young Sheldon. But the same could be said for every Monday night from 8 to 10 on CBS, as every comedy surrounding 9JKL crashed. The Big Bang Theory was the harshest drop from a raw numbers standpoint, sinking by a point and a tenth to 3.0, way below that 4.1 premiere. Kevin Can Wait sank to 1.4, down nine tenths from the season premiere. Me, Myself & I was down to 1.0 after a decent 1.6 start last week. And though it was down the least, 10 PM drama Scorpion had a rough night, too, hitting a new series low of 0.9 (with a 0.8 in the second half). ABC was preempted for football in a dew major cities, but as it stands now, both DWTS and the Good Doctor are up two tenths. If it can manage to drop two tenths or less, the Good Doctor could manage to be steady with its huge series premiere. NBC's the Voice was down a tenth from last Monday, as was the Brave. The Brave is doing some really mediocre numbers right now, and with that 1.2, it is now retaining less than 50% of the Voice. It's not a good start for the drama, and at this rate it will have a hard time even trying to get a backorder, let alone a renewal. Fox had the premier of the Gifted, and the comic book series did pretty well for the network. It didn't do huge numbers, but it was off to a solid start and it probably won't sink far enough to be in any danger of cancellation. Before Gifted, Lucifer had a 1.1 start, up two tenths from the May finale. Finals Update: Dancing With the Stars (-0.2), The Good Doctor (-0.2), Scorpion (-0.1), Kevin Can Wait (-0.1), and Scorpion (-0.1), The Brave (-0.1). and a Legends of Tomorrow repeat (-0.1) adjusted down. The Big Bang Theory (+0.2) and The Voice (+0.1) adjusted up.